R.O. Anderson provides landscape architecture services for parks, open space, educational institutions, mixed-use communities, private residential estates, commercial sites, and small urban gardens. Our team is well versed in the diverse landscapes, soils and vegetation of the Sierra and Great Basin region. Our clients have come to rely on our creative instincts, as well as our detailed site assessments. 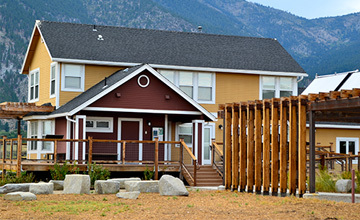 Our design approach seeks to provide enduring landscapes while addressing our clients’ needs, even in the most sensitive landscapes such as the Lake Tahoe Basin. We work closely with public entities as well as private property owners, to develop design details and illustrative drawings that create captivating spaces to compliment both natural and man-made environments. Our services include the development of conceptual design details concepts and illustrative presentation packages, cost estimates and final project details and specifications. Once a design is selected, we provide design development specifications and participate in on-site construction observation. Through landscape design, we strive to increase the quality of life within the communities we serve by creating spaces that instill a sense of place. 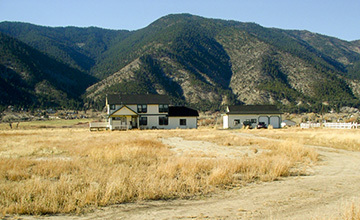 The objective of The Nature Conservancy was to develop a trail system on its historic 800-acre River Fork Ranch near Genoa Nevada, which would provide recreational access and interpretive opportunities without compromising the ability to continue its existing agricultural uses, wetland functions and integrating wildlife habitats. Using our survey capabilities and orthographic photography, a site plan was prepared which guided our spacial planning that focused on creating a trail designed to complement the historic site structures and reduce conflicts between visitors, specific habitat areas to be preserved and ongoing agricultural operations. We prepared a master plan for the trail system, as well as the design documents necessary for construction, permitting, and construction bid process. 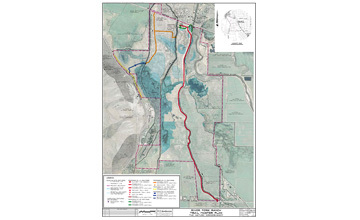 The project’s features includes an extensive trail system to be developed over five phases, in addition to providing access to a variety of natural points of interest provided by the site, including public access to the Carson River, an ADA compliant outdoor interpretive addition to the existing Whit Hall Interpretive Center featuring a path, signage, planting areas, boardwalks and providing key connection points to several future off site trailhead locations all while working to minimize the project footprint through the use of existing, recycled, and natural materials.